The top three poems will each win a cash prize; a further seven will be commended, and all 10 will form part of an exhibition. Entrants can submit up to three poems. Open to all over-18s in Nottinghamshire. Are you inspired by Nottingham’s Green Spaces? There are plenty of them – Nottingham has been awarded 22 Green Flags for the excellence of its parks. Some of them are also amongst the oldest parks in the country and are protected from development by an Act of Parliament passed in 1845 and these have been explored by the Nottingham Historic Green Spaces project. There is an association between these spaces and creative literature. The Arboretum and public walks, like Queen’s Walk and Elm Avenue, were partly inspired by the Sherwood Forest school of writers, while the opening of the Arboretum in 1852 was commemorated in a poem by Edward Hine, published in the Nottingham Review, 14 May 1852. 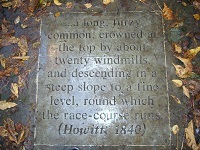 The following week The Review featured another Hine poem, ‘Nottingham Park by Midnight’. Poems can, of course, imaginatively combine more than one theme, and weave in new ideas from the poet’s own imagination and experience. We welcome poems from established as well as new poets. The competition deadline is 5pm on 1 August 2016. Please read the Competition Brief carefully before submitting your poem(s). Thank you!